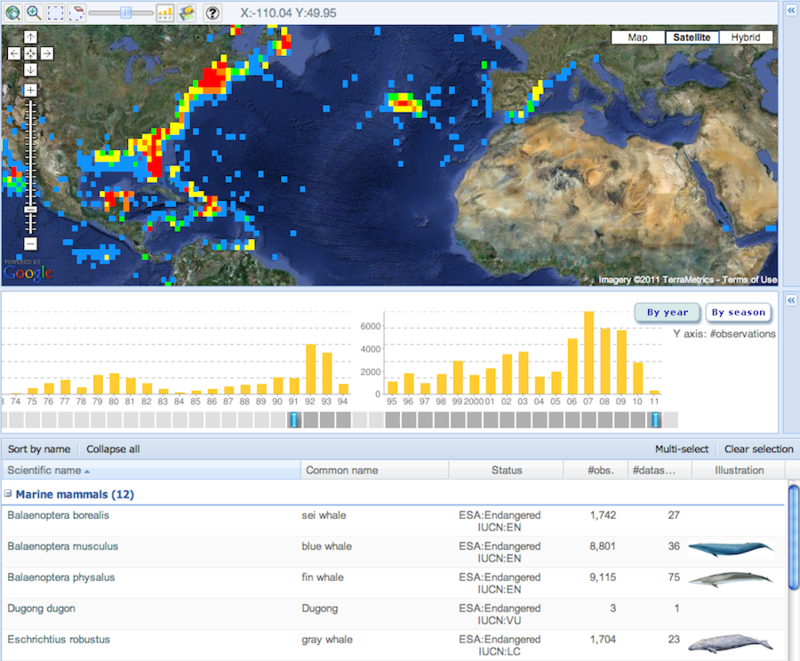 OBIS-SEAMAP (seamap.env.duke.edu) is a spatially and temporally interactive online database for marine protected species, collecting data from ship/aerial surveys and satellite telemetry as well as acoustic monitoring and PhotoID around the globe. This 10-year and on-going service is made possible by contributions from data providers all over the world. As of 2011, the OBIS-SEAMAP database holds over 4 million records for over 600 species from more than 400 providers and it’s ever growing. The OBIS‐SEAMAP web site offers advanced tools including representation of oceanographic variables, spatially and temporarily scalable animation of tagged animal movements, expanded metadata search for acoustic datasets and online workflow for viewing and matching photo‐identification images. In response to growing data needs for effective marine mammal conservation, more national and international agencies are using the OBIS‐SEAMAP database and advanced technologies the project offers. Examples include: noise impacts on cetaceans, off‐shore wind energy site selection, marine spatial planning and identification of ecologically and biologically significant areas in open waters. As a thematic node of the Ocean Biogeographic Information System (OBIS), OBIS-SEAMAP has been one of the largest data providers to OBIS. In addition, advanced mapping and visualization technologies that the OBIS-SEAMAP project innovated were applied to the renovation of the OBIS Portal web site in October 2010. The OBIS-SEAMAP project aims to facilitate and advance research on biodiversity, abundance and the conservation of marine megafauna from spatial and temporal perspectives. We still greatly encourage data contributions, large or small, from any part of the globe. In 2011, the OBIS-SEAMAP project received continued funding from NOPP through NSF to improve metadata and mapping & visualization for passive acoustic monitoring data. See OBIS-SEAMAP Acoustics for more details.